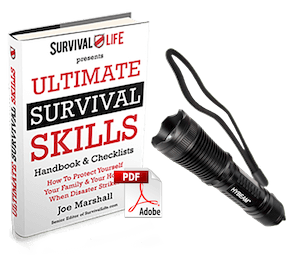 Free Survival Gear - Build a Survival Kit for Almost Nothing! A lot of people are looking for free survival supplies. Luckily, we can take advantage of free gear offers from certain companies. One of the latest marketing techniques that survival gear companies are using is to give away a free item with the hopes that the person who takes advantage of the free offer will become a long-term customer. Most of the offers below are structured in a similar way. The price you pay covers the shipping for a free piece of gear or training and the company hopes that you’ll be impressed enough to continue to buy from them. If you like their products, then feel free to become a customer. If not, at least take advantage of the free survival gear they’re offering. These money-saving offers could even save your life! Normally the company asks that the customer pays for the shipping costs. These usually run somewhere between $3 and $5. 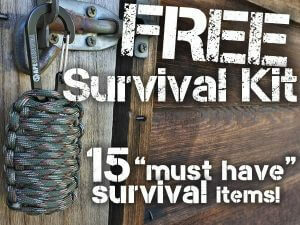 We’ll add more free survival gear to these offers as we find them or more become available. 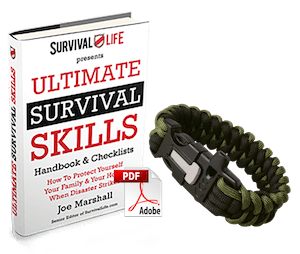 Ape Survival Survival Grenade – Typical “survival grenade”. Contains 15 items. The best use for these is to simply clip it on a bag until you need it. 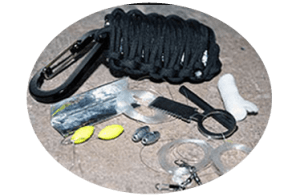 Paracord Survival Kit – Another “survival grenade”. 10 items wrapped in 9 feet of paracord. 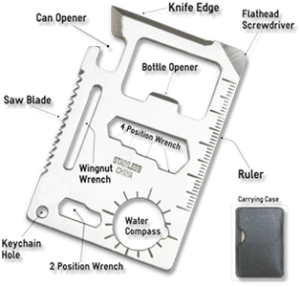 Hoffman EDT Mini 7-in-1 Multi Tool – A 7 in 1 multi-tool for every day carry. Ideal for throwing in the glove box or in a survival kit just in case. 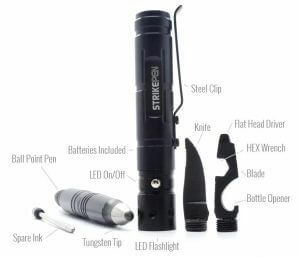 Strikepen – LED flashlight, pen, tungsten striker point, and two interchangeable tools. Survival Business Card – Typical survival card. Contains 11 tools. 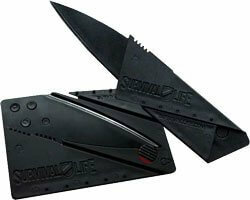 Credit Card Knife – This is an interesting little knife that folds up and hides away in a wallet. It isn’t practical for everyday use but it could come through in a pinch. 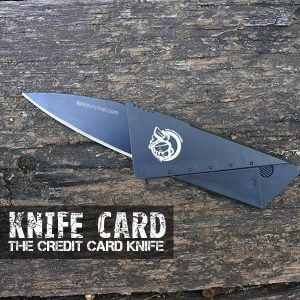 Knife Card – Another folding concealable credit card knife. Rescuecard – One of the better-looking survival cards. Contains 14 tools. Hybeam Tactical Flashlight – Another LED flashlight. Aluminum body with beveled edge for striking. Comes with a lanyard. 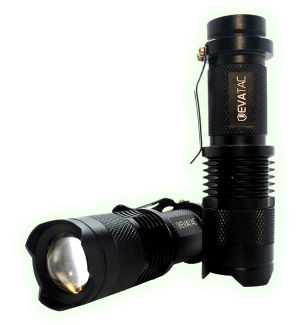 Q5 TacLite – Uses a new Q5 CREE LED emitter to throw light up to 1100 feet. It uses a single AA battery, has an aluminum body and pocket clip. Great as a backup EDC flashlight or to put in the car. J5 Tactical Flashlight – LED flashlight outputs 250 lumens with aluminum body and pocket clip. Another great back up light for the house or the car. Hybeam Micro Tactical Flashlight – Very small, water-resistant, and easily slips into the pocket. Aluminum body with a pocket clip. Fire Laces – Shoelaces that double as a fire starter. One of the better survival hacks out there. Everstrkye Match – Contains a ferro rod, wick, and fuel for more than 15,000 strikes. Limit 10 per household. FireKable Paracord Bracelet – 80 feet of usable cordage with a ferro rod. 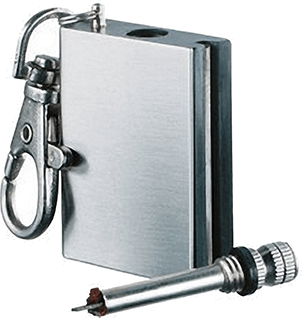 Everstryke Waterproof Lighter – Usable for 15,000 strikes. Sealed to prevent leakage of fuel. 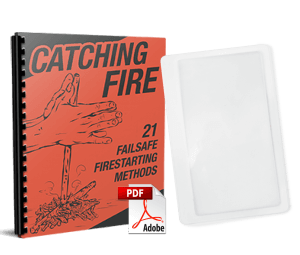 Optic Fire Starter – A simple, yet often overlooked fire starter. Focuses the sun to light tinder quickly. The Doomsday Medicine Chest – Alternative medicine handbook for post-collapse survivors. Deck Of Seeds Cards – This is an interesting deck of cards. 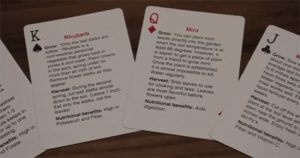 It has info about different herbs, vegetables, and other food on the back of each card that give tips on growing and harvesting them. 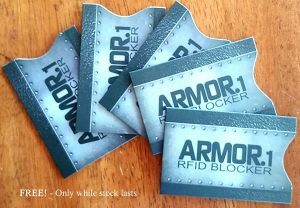 Armor.1 RFID Blocker – 5 pack of RFID blockers to prevent scanning of credit cards and chipped ID cards. RFID Blocker – Blocks scanning of credit cards and chipped cards. Each one holds two cards. 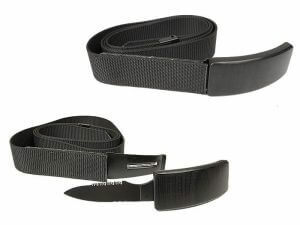 Valois SSD-90 Tactical Knife Belt – A web belt with a concealed knife in the buckle. Adjustable from 24 to 52 inches. 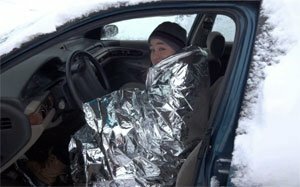 Emergency Survival Blanket – Typical mylar blanket. 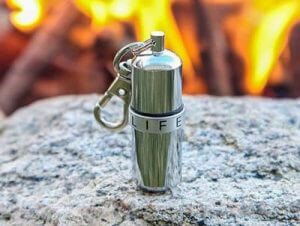 Good for throwing in a bug out bag, car, boat or backpack. When you’re first getting started, it can be expensive to build survival kits for your family and bug out bags, cars, etc. If you buy some of this “free” survival gear you can get started with less initial investment and replace them as you purchase better gear at a later date. The free survival supplies that we’ve listed above should take you well on your way to putting together as many survival kits as you may need for very little money. The items aren’t military grade, but they do work and could help you out during a disaster. 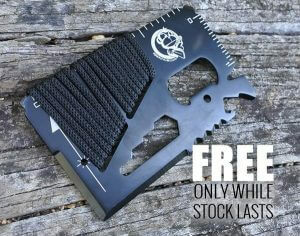 Do you know of any good free survival gear that you’d like to share? Let us know in the comments section. I’ve taken the plunge on some of these in the past and you’re pretty much spot on. They’re good for backups or filling gaps that you may have in some of your kits. They’re not the best but they work and everything is pretty much just a couple of dollars.